EssentOne builds on decades of success and experience to deliver a fresh, yet completely familiar way to manage the critical parts of your business. Accessible on any computer, tablet, or phone with a modern web browser. The interface is elegant. The system is friendly. The results are powerful. The system that allows you to be you. EssentOne is designed with you in mind. The system is highly configurable to meet your unique workflow. Utilized by companies large and small, the system scales like no other. With EssentOne you have the unrivaled ability to effortlessly manage complex business cases and build a strong, efficient business. All the tools. One Toolbox. EssentOne has all the tools a professional needs to get the job done. Visualize your business like never before. 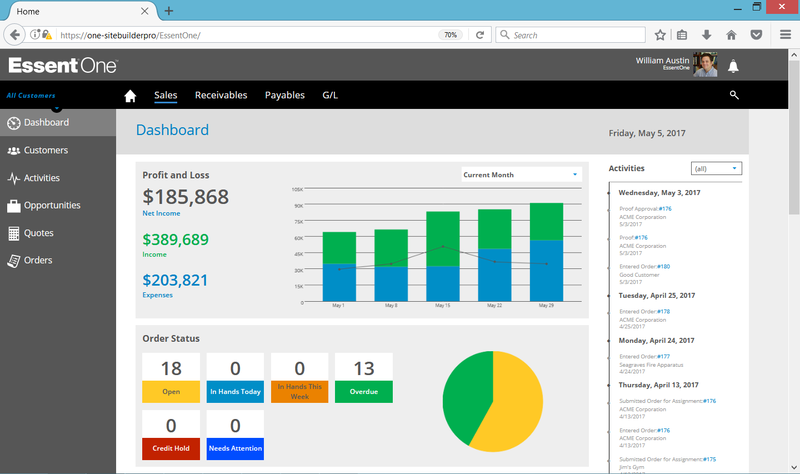 The EssentOne user interface is beautiful, offering crystal-clear, actionable data. The system displays highly-informative, real-time scorecards and analytics tailored for each user. EssentOne models and tracks historically-rich business data, for a longer period than any other system. With EssentOne you physically see performance: where you were, where you are, and where you will be. A system as organized as you'd like to be. EssentOne is designed with organization in mind. All of the documents you work with are stored electronically in the integrated Document Management System. All of the activities you perform are automatically cross-referenced and linked with other relevant elements. EssentOne organizes data with minimal effort for maximum effect, putting information instantly at your fingertips. EssentOne is built on the Essent Commerce Engine. Out of the gate, the system is automatically integrated with other industry-leading business solutions from Essent including Compass™, SiteBuilder™, and OrderTrax®. With EssentOne, start with what you need and add functionality as your business evolves. Schedule a time to see your business future in action.